How can Music Help your Little One? Music is amazing because it can actually sooth the soul, it can energize you, it can comfort you, and it can also be an amazing early childhood education tool for your kids as well. When your children learn music at a young age, they will benefit greatly! As a matter of fact this is one of the most important kinds of early childhood educations in Riverside, California! 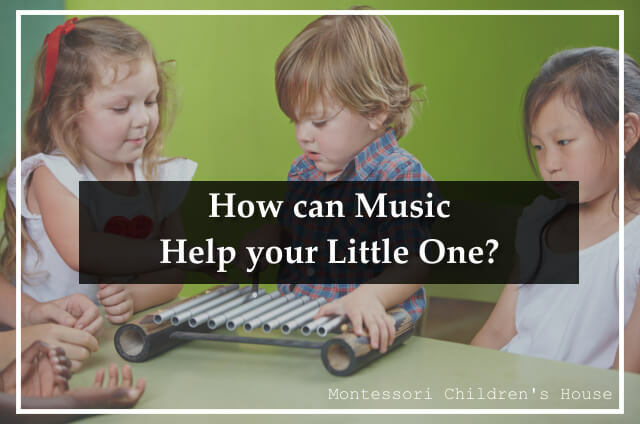 Montessori Children’s House believes that this is a very important part of an early childhood education and it can really benefit your little ones in more ways than just one. There are a lot of forms of music you can teach your kids, but at a young age it is generally better to keep it simple. Even though they are just playing some basic music, this can really help your children for a number of different ways. Usually, children at a young age can begin learning music by playing the recorder. This is a very simple instrument but it can help your kid learn many things such as rhythm and scale. This will assist your kid out in their academics especially in math. The rhythm in music goes hand and hand with mathematics in a child’s brain and when they learn how to play music, they will actually have an easier time with math. Some of the other benefits of learning music at a young age are that they will have improved memory. This is because they need to remember a lot of the music they are playing, thus exercising their memory and improving it for both short term and long term memory. So as you can really see, it is not that difficult to teach your child the basics of music at a young age and the benefits they will enjoy from this are almost limitless. If you want your kid to succeed in their academics and excel in life, then letting them learn how to play music is a wonderful way to do that. If you want to learn more about early childhood education, just give Montessori Children’s House a call at 951-359-5437 today! This entry was posted in Child Education, Early Education and tagged academic programs, childhood education, music, music for children. Bookmark the permalink.